Insurers should cut back on writing total-loss estimates, a consultant urged Thursday on a Guild21 webinar, arguing it would create a net benefit to the environment, economy, and customers. Such actions are part of replacing older “take, make, waste” and pure-capitalist business models with ones considering a broader “triple bottom line,” said Shesterkin, a former AzkoNobel manager who still consults for the company today. The concept refers here to collision repairers and related stakeholders seeking gains in three dimensions: Economic — yes, you still get to make a profit — environmental and social. By stimulating all three of these areas, the model becomes sustainable and cyclical rather than the linear “take, make, waste” version Shesterkin criticized. The stock market agrees with that stance, according to Shesterkin. He cited Neuberger Berman research showing that a portfolio of all actively managed “socially responsible” equity funds has beat the Standard & Poor’s 500 and Morningstar Large Blend between July 2001 and February 2014. 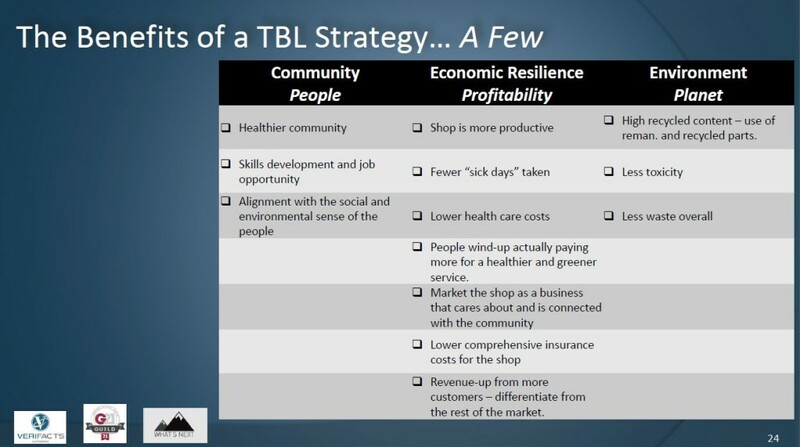 “The triple bottom line is working,” he said. Shesterkin also gave the example of the Ford Pinto scandal. From a purely cost-benefit analysis, he said, it didn’t make sense to fix the problem – even if people would, and did, die. Except Ford’s reputation suffered tremendously (and the Ford Pinto remains a punchline and a business ethics case study years later). Triple-bottom-line thinking would have called for a closer look at the social and intangible ramifications before the issue arose. Such bigger-picture business thinking indicates fewer cars should be declared total losses except when necessary for safety, Shesterkin argued. “This concern is for each of us,” he said of the growth of total loss vehicles. CCC has estimated that 9 percent of vehicles were determined total losses in 2000, but that number grew to 14 percent by 2014. The estimating service concluded an aging vehicle fleet was responsible for the increase. Shesterkin said there was “something fundamentally wrong” about the increase. It fills landfills, consumes more resources — only 20 percent of a body panel is made from recyclable materials, he said — and costs repairers jobs. “Those in that place bear the brunt of this issue,” Shesterkin said. Insurers certainly take the biggest hit under this cost-benefit analysis, but Shesterkin argued that the reduction in customer churn could be worth it. He might have a point; J.D. Power research shows customers aren’t loyal to their insurers, even though most can’t find a cheaper carrier and don’t switch. 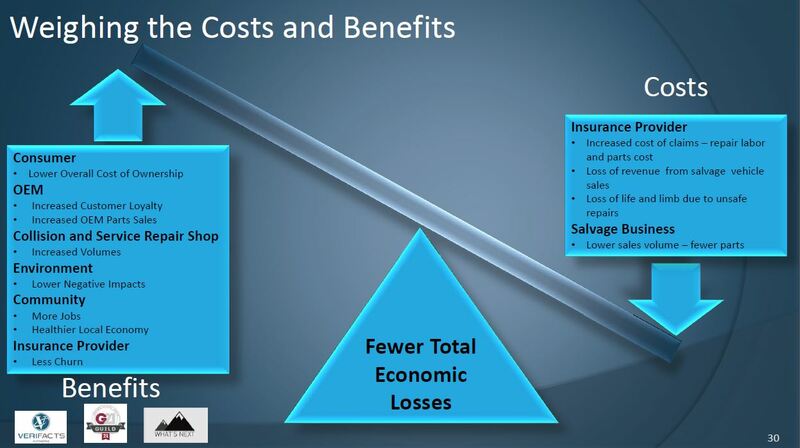 If an adjuster totals a car and inconveniences the customer, it creates less of a reason to retain that carrier. And in the case of a single-car household, the insurer has just removed the customer’s need for any auto insurance. That cancellation means the carrier also misses out on monthly, investable premiums as well as a customer to target for bundling more profitable policies. 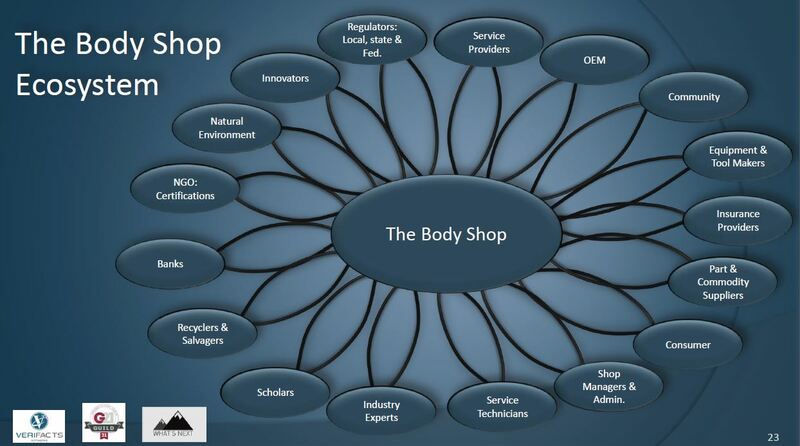 Shesterkin also called for collision repairers to consider an entire “Body Shop Ecosystem,” pointing to a model including nearly 20 other interests. That model was developed at the request of the Detroit-based Green Garage, which asked Shesterkin for a triple-bottom-line collision repair case study. Such considerations could result in productivity benefits from a happier workforce, reputation gains among the community and environmental benefits good for the planet and its inhabitants. Want a more quantitative reason to think about the environment? Consider what using less energy to dry refinished vehicles would do for a high-volume shop. Or switch to lower-VOC waterborne paint and refinish an extra car a day because of productivity savings from better color matching, as PPG has estimated is possible. In this vein — and more controversially — Shesterkin also advocated recycled and remanufactured parts. Such components save between 70 and 92 percent energy, water, chemical products and production waste, Shesterkin said, citing Ellen MacArthur Foundation research. It’s an interesting theory, although such a decision in all fairness should be the customer’s own informed choice, not one made de facto for them by a shop or insurer. 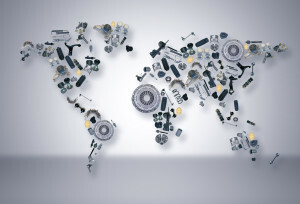 There are also safety, fit and quality concerns, though a true Opt-OE remanufacturer program or a trusted recycler or official surplus OE could ameliorate these. Shesterkin’s points were theoretical; he didn’t have specific examples of shop X saving X dollars by a triple bottom-line approach or insurer Y seeing Y percent less churn. Still, the points are insurance and repairer food for thought, and might have the potential to sway industry leaders present for the Guild21 call. Audience members indicated an interest in joining a task force to further consider such points later this year or earlier next year.